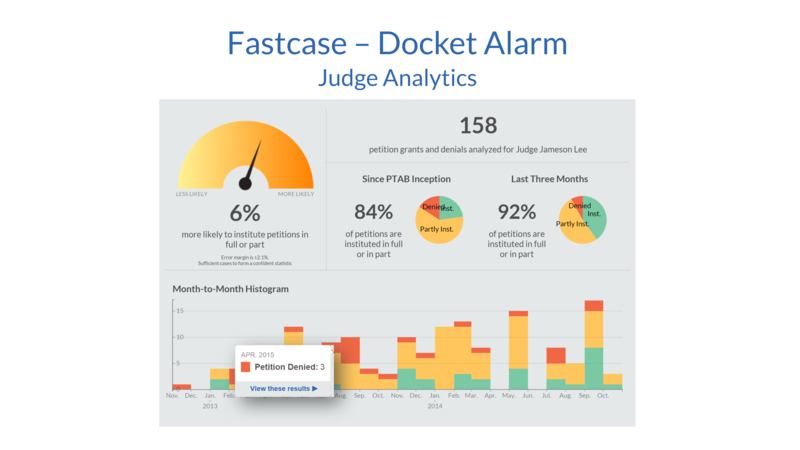 Fastcase today announced that it has acquired Docket Alarm, a company that mines federal and state court dockets to provide litigation alerts and case-prediction analytics. Docket Alarm’s advanced analytical capabilities, customizable real-time litigation alerts, case prediction indicators, and technology-driven research tools complement Fastcase’s quest to add unique, must-have content for its subscribers and provide leading legal analysis with contributions from firm partners across the country. Founded by intellectual property litigator Michael Sander, Docket Alarm started as a company focused on federal court docket alerts, but in recent years it has expanded the number of state court dockets it covers. It has also expanded in analytics, using docket data to predict litigation outcomes and to to provide analytical profiles of judges, parties, law firms, and attorneys. Its analytics can provide information such as win rates, time to decision, and gender diversity at law firms. In addition to court dockets, Docket Alarm also includes data from the ITC, PTAB, and TTAB. Sander will join Fastcase as managing director of Docket Alarm and director of Fastcase Analytics. Current Docket Alarm subscribers will continue to have access to their accounts through docketalarm.com with their login and password with no disruption to their access.